Whisk milk and eggs until smooth, add bread crumbs and soak them for 5 - 10 minutes. Using your hands, mix the meat in a bowl with the grated onion and garlic, salt, pepper, sweet and hot red paprika and soaked bread crumbs until evenly combined. If necessary add some more bread crumbs. Form the mixture into 4 - 5 patties, slightly flatten each one. Place a quarter of the potato in the middle of each patty, wrap it with the meat. Cook patties in hot oil for 2 - 3 minutes on each side until golden brown. Transfer patties into the ovenproof baking dish and set aside. For the sauce, sauté onion in olive oil; add flour, stir and reduce the flame. Whisk and combine milk, sour cream, tomato paste, salt and pepper until smooth. Always stirring, gradually add the mixture to the pan and continue to whisk until the sauce is smooth and creamy, but not very thick. If the sauce is too thick, add a little more milk (the sauce will thicken during baking in the oven). Cover kofte with the sauce and bake in the oven for 30 – 40 minutes at 200°C or until the potato is done (trick with a toothpick). Serve with braised sauerkraut or a simple green salad. 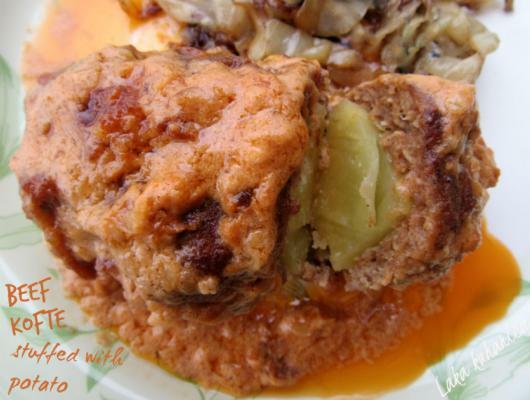 Ground meat wrapped around potato and baked in silky sauce makes a complete meal.